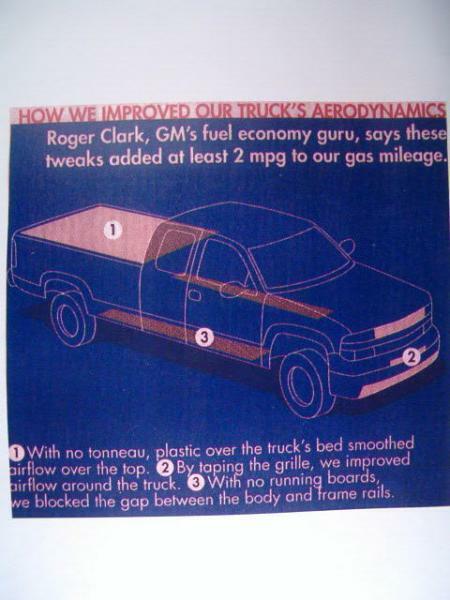 The grill block was one of the recommendations listed by Rich Taylor of GMC truck division for MPG increase with Popular Science' Sierra. If you can find the Phil Knox aerodynamic photos album,there is a copy of the graphic showing aero mods recommended for the pickup. It doesn't quantify each mod individually, so it's hard to say how much it affects mileage. My next step is blocking the area between the frame and the body between the wheels (#3 in that image). I want to get rid of the canopy and get a tonneau cover instead, but that's a tough sell with my wife. She finds the canopy too useful even though I find that it gets in the way.